Grinding is an important process to remove the material efficiently. Before the finish machining, it is necessary to remove the cusps by the wider grinding band for obtaining more uniform allowance. 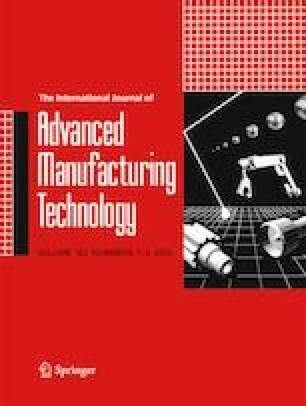 In this paper, the grinding wheel hold by the multi-axis machine tool is introduced into the free-form surface grinding. The engagement between the wheel and the to-be-ground surface is established for generating the paths. An instantaneous engagement model is proposed in terms of machine tool kinematic chain, and the spatial engagement is represented on a group of planes. Based on the engagement model, the grinding path generation for enlarging bands is transformed into an optimization. Different with traditional path generation, a slight local overcut is allowed on the wheel locations. However, the envelope of grinding engagements is limited in the required boundaries to satisfy the design tolerance. They are realized by adjusting the contact locations and orientations of the wheel. At last, a compressor blade is used to verify the advantages about the proposed path generation method. This study received financial support from the National Natural Science Foundations of China (Grant Nos. 51775445 and 51475381), the Xi’an science and technology project (201805042YD20CG26-(9)), and the Aeronautical Science Foundation of China (Grant No. 2017ZE53053).